Feel the typical atmosphere of Europe is not complete without enjoying the antique buildings. Visit the city of Dresden in Germany. This old town will take the traveler back as the 18th century. Located on the banks of the river valley Elba, Dresden is making history as a tourist attraction tourism. The state capital of Sachsen (Saxony) is able to attract nearly 10 million tourists a year. What are some that can be enjoyed in this old town? 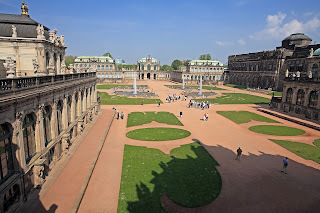 Tourists usually start from the Zwinger Palace, Dresden main attraction. Zwinger palace was founded by Polish King Augustus the Strong in the span of years 1710-1728. At that time, Dresden entered Polish territory, not German. Zwinger building, a square with a garden in the middle. This building was once a gallery of paintings, sculptures and weapons empire. Today, the Zwinger museum becomes a place for 6 including a museum of paintings, porcelain, weapons, and equipment to the 13-17 century astronomy. Satisfied around the Zwinger, the tourists can go out into the square which is very broad. The atmosphere of the 18th century was immediately felt. In the sweep of the eye, that there is a row of buildings from the past. 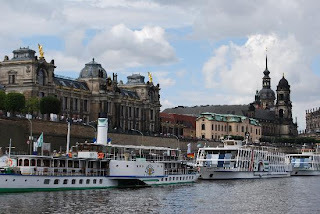 If overlooking the river Elbe, on the left there is the opera house named Semperoper built in 1841. On the right there is the palace Residenzschloss the king's residence until 1918. The journey along the old city will continue to the next Residenzschloss. There was a huge wall mural along 102 feet, which is named Fuerstenzug. This painting tells the story of the order of the genealogy of the kings of Saxony in the image of the king on horseback. Fuerstenzug paintings are large and dominant to make the road beside it together like a time tunnel. One block after Fuerstenzug, we arrive at the end of the search the old town of Dresden, the Frauenkirche church and pretty. This is a Protestant church that was built in 1726 during King Augustus the Strong. Baroque-style architecture and beautiful paintings on the ceiling of the church, became a magnet visitors. Although today's Dresden looks pretty, no one thought this town had been destroyed. In World War II, British planes bombed the city for the crushing strength of Nazi Germany. A variety of historic buildings including the Frauenkirche, in ruins alone. Since after World War II, citizens of Dresden was fought many years to renovate the city. The latter is the reconstructed Frauenkirche brick by brick until completion in October 2005. A love of historic buildings is admirable.